Hopefully you will never have to find yourself pulling fighting dogs apart. It’s dangerous and can result in you being injured no matter how careful you are. The well-known method is to pull a dog away from the other dog by grabbing around the hips or waist and pulling the dog away. But that’s not always easy to do depending on the way the dogs are situated, how fast they are moving, and if you’re alone. What is the best way to prevent a fight? Socializing your dog as a puppy will cut down on chances of a dog fight. Work with a trainer, practice the methods you learn, and address any behavioral problems you notice in your dog that could result in fear biting. If your dog is afraid of sounds or changes in the environment work with the trainer towards desensitizing the things that trigger your dog. If your dog is not dog friendly, do not bring her to the dog park and cross the street when on a walk if you see another dog coming towards you. On walks, if you walk by a house with a dog in the yard, keep your dog focused on the walk rather than growing or trying to lunge at the fence or house. If you see another dog out on a walk, you can cross the street and have your dog to sit and wait instead of barking and pulling. If your dog is aggressive towards other dogs to the point where it can be extremely tough to pull her away or redirect her attention, walk her during off-peak times at the park and around your neighborhood. Many people walk their dogs after work and you may have to wait a little later than that or find a few blocks that aren’t often visited by your neighbors with their dogs. If you see an unleashed dog jogging around, yell for the owner to get their dog, and tell them yours is not dog-friendly. Pull the leash hard to get your dog away from the approaching dog. If the owner is present, yell for them to get their dog. If the dog attacks your dog or you, yell “HELP!” as loud as you can. Do not stick your hand in their faces as this could result in you being bitten. Use the leash to try and get your dog away from the attacking dog and stay as calm as possible. If your own two dogs get into a fight in the yard or in the house over a toy or treat, try throwing water at them. It startles the dogs and gives you a few seconds to draw the attention away and separate them. You may have to sometimes use an object like a stick or broom to pry them apart and create a barrier. At a dog park, use a spray bottle with water in it or throw the water from the water bowl works to give you a few seconds to get your dog away from the other dog. This can be tough but if you are able to lift the dog off the ground a few inches to a foot or two, it will throw them off balance and give you enough time to get the other dog to a safe place. If you’re alone and breaking up a fight, when you grab the dog, find a place to put the dog – another room, the garage, or in the house. Don’t hesitate to place your dog somewhere safe like on top of car roof, on a garbage can, or anywhere that is high enough to make it tougher for the attacking dog to get yours. It sounds odd but it does work. Yell for help. 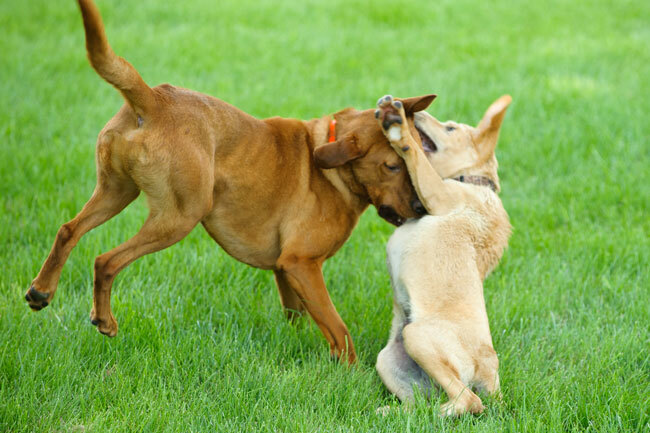 Some dogs who are aggressive towards other dogs are not aggressive towards people. If you have a big dog and can’t lift your dog up, yell for help and try to place something between your dog and the approaching dog to create a wall or shield. A garbage can lid can work or anything that can cause a barrier, do not ever place yourself between the dogs! Do you have other tips? Share them with us.